Ah, OK, I didn’t know. Thanks for the note. If your extension has an entry in the Visual Studio Marketplace, and that entry has amassed a pile of reviews, ratings, Q&A’s etc., I’d recommend a third choice: use that existing Marketplace entry for a version targeting as many VS versions as possible, meaning VS 2012-2017, and only introduce a new VSIX for your smallest possible audience, meaning VS 2010. I have to VSIX installers, one for 2015 and the other for 2017. Unfortunaly when I try to install the 2015 version I get an error about the manifest being corrupt. The issue is that since I installed VS 2017 after VS 2015, 2017’s version of vsixinstaller.exe is associated with .vsix files. So when I double click on my 2015 VSIX, it uses the newer installer which doesn’t find catalog.json and manifest.json and fails with the rather unhelpful error message. I can always directly invoke the vsixinstaller.exe from VS 2015, but that’s not very user friendly. Microsoft.VsSDK.targets(621,5): error MSB4018: The “GetExtensionsPath” task failed unexpectedly. Microsoft.VsSDK.targets(621,5): error MSB4018: System.IO.FileNotFoundException: Could not load file or assembly ‘Microsoft.VisualStudio.Settings.15.0, Version=15.0.0.0, Culture=neutral, PublicKeyToken=b03f5f7f11d50a3a’ or one of its dependencies. The system cannot find the file specified. So if I disable VSIX deployment it builds fine and my VSIX has the new files, but now I can no longer debug in 2015. I seem to have the latest Microsoft.VSSDK.BuildTools – 15.0.26201. Is that a known issue or am I just missing something? We too have many problems while updating our VSIX. What has been your solution? This is a vague update to building the VSIX with VS 2015. Does this mean the resulting VSIX will be compatible with VS 2017? From what I’ve seen, it doesn’t create a VSIX v3 compatible file. Are there extra steps to achieve this build setup? 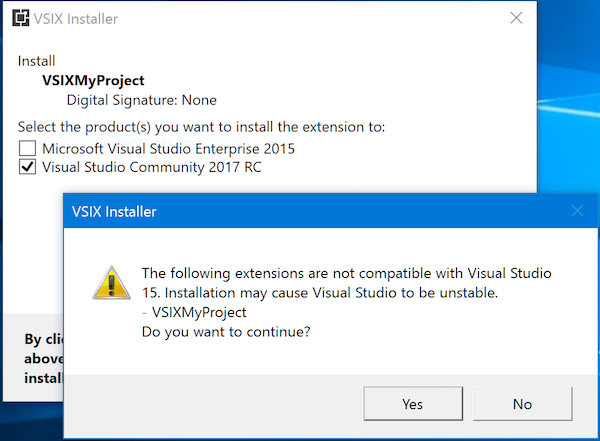 FAQ: Can I build a VSIX v3 with Visual Studio 2015? @Tim you need to add a reference to the NuGet package to the project, add the v3 tag (manually) to the project file and hand edit the extension.manifest file to describe the prerequisites. It also looks like the VS2015 NuGet package also works with VS2013…at least for now. The trick for that one is to hand merge the changes from a VS2015 version of the project to the VS2013 one. I installed 2017, upgraded the project, and added the prerequisites section, but it still doesn’t create the 2 json files. I even tried adding the SDK build tools GIT package – even though I had installed the VS2017 SDK component so that it shouldn’t be required. Same result. Is there something else that might be making it think it is a V2 package … or causing it to use the 14.0 build tools? I’d suggest to start a dummy VSIX project and package from start and then compare with the migrated project. Thanks. I had already tried that … but I had missed the fact that a path [symbolic] had changed in 2 Imports at the bottom of the project file. When I changed it to the new symbolic it started to generate the missing files. There are no error messages and the ‘Extensions and Updates’ page seems to indicate that all is well. I tried using the /log parameter when launching VS but the log produced simply says that the extension was loaded correctly. Is there something I can switch on to make it display the actual load process and whatever error is causing it not to actually load even though it seems to think it has? I finally realized that the pkgdef file was not getting generated – hence no menus etc. I had updated the project file by copying lines from an empty 2017 VS extension template project … and for some reason that project had GeneratePkgDef=false. When I changed that to ‘true’ everything started to work.